The Southern Oregon coast is a mecca of recreational opportunities with something for everyone; world class river and ocean fishing, tide-pooling and beachcombing, whale watching, crabbing and clamming, hiking, biking, museums and art galleries, jet boat cruises up the Wild and Scenic Rogue River, local festivals, summer theatre, world champion wind surfing, golfing, camping, skate boarding park, concerts, dining, nearby casinos, and fabulous sunsets. Explore our beautiful shores and activities in a secure small town setting. 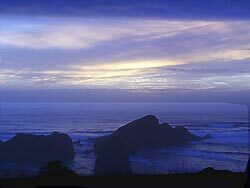 Curry County is situated along the Pacific Coast in the southwest corner of Oregon. It is bounded on the south by California, on the west by the Pacific Ocean, on the north by Coos County, and on the east by Josephine County. The county contains 1,648 square miles. In 1852, explorers discovered gold and other precious metals in the rivers and along the beaches of this area. Initially, settlement in the county was concentrated along the coast and depended primarily on water transport. The slow development of inland transportation routes kept the county relatively isolated well into the twentieth century. While there is still mining of cobalt, nickel, and chromium in the southern part of the county, most of the county's economy has reoriented to agriculture, recreation, tourism and forest products. Port Orford cedar (Lawson Cypress) and myrtlewood are important export commodities.